Living Springs Camp has been in business for over 20 years. We cater to strictly Non-Profit Organizations ( Please provide NPO number when calling). 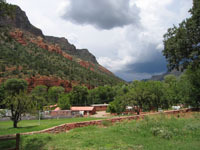 Living Springs Camp is located on the banks of Oak Creek Canyon in beautiful Red Rock Country at the base of Wilson Mountain. Along with Oak Creeks running waters a natural artesian spring runs through the middle of Living Springs Camp. Tall canopy like trees, beautiful flowers, lush green lawns and an abundance of wild berries tucked into the ponderosa pines. We are a very peaceful and nature loving camp. We host to churches, new age groups, Boy/Girl Scouts of America, and wedding ceremonies just to mention a few groups. 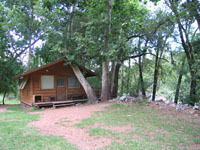 Living Springs Camp is open year round. We will make reservations 1 year in advance. $150 deposit is required when making reservations. The deposit will be refunded after the camp departs, provided there are no damages, repairs or cleaning needed. Groups are required to provide their own cooks and food. We suggest campers bring anything to make them comfortable for camping such as extra sleeping bags, pillows, etc. Also, to make your stay more enjoyable bring plenty of sunscreen and bug spray with you. We also have a volleyball court and horseshoe pits(Horseshoes and volleyball provided). However, any other sporting equipment must be provided by campers. Since we are a peaceful retreat we strictly enforce a noise ordinance after 8p.m. Please feel free to contact us for available dates and or any other questions you may have. Again, Thank you for choosing Living Springs Camp as your retreat destination.